recession. Other people want to stick to the same brand that they have always fitted to the car and are satisfied with the performance they have had out of their old ones. We generally find that the customers who come into the depot will take our advice on the products that we recommend. Over the tears, we have sold millions of the round black things covering many brands and as long as we have the trust in the products that we sell, then the customers are prepared to take our advice. At the moment, we are very big advocates of Mid-Range Kumho Tyres and also General mid-range tyres, we have every faith that the Mid-Range Kumho Tyres Ecsta Le Sports KU39 will perform extremely well and this confidence is passed onto our customers. I have personally travelled to watch racing BMWs screech round the race track fitted with KH17 and I have asked the car drivers for their opinion about their performance, and I got nothing but praise for these tyre Reviews. This gives me great confidence when selling this excellent product. Consumers must select a product that will work year ’round and in most conceivable driving situations. However, motorists often ask their cars’ tyres to do many things, and there are many times a vehicle’s tyres aren’t up to the task. Selecting the right ones for your driving needs is as important as selecting the right vehicle. The ones that are badly worn won’t be able to displace enough water to prevent aquaplaning Performance Summers won’t be able to get much grip in snow. All-season tyres can’t manage the heat build up in high-speed driving. Passenger car tyres might not be able to carry the heavy load found in a contractor’s pickup. But before consumers can select the right tyres, they have to understand a little tyre technology first. Worn tyres won’t be able to displace enough water to prevent hydroplaning. High-performance tyres won’t be able to get much grip in snow, but winters will give you the grip in snow that you want, as I have stated find the right ones for the job and you will be safe in the knowledge that you have been advised correctly by tyre experts here at Pellon tyres in Halifax. Our customers will buy what they can afford to buy. Hence, in these times of tight recession and strict household budgets. (I myself do not blame them and sometimes will go for the cheap option). I think that it may be worth pointing out that cheap part worn tyres “are what they really are”.Most of the cheaper brands are copies of tyres (many using inferior quality ingredients) that are made by the major tyre companies and usually made in the far East and China. There is nothing wrong with tyres made in China. Because all imported tyres into the European Union will shortly have to be tested for different qualities. Thus, due to the impending new labelling system. That comes into force later on this year. Therefore, and all imported tyres will have to have certain standards. remoulds. The later being the safest of the two choices. Remember it is your own and your families safety.That should be considered when buying all types of car tyres. As I have stated if you are financially stretched it may be worth considering a drop to a mid-range tyre. 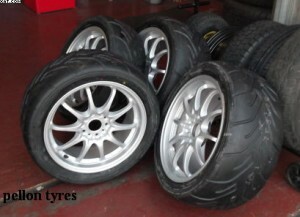 The Mid-Range Tyres are also much better in quality to cheap tyres imported from the far east. Motorists who have normal family cars will be fine on economy new tyres whilst the guys who drive Mercedes and BMWs, should really stick to the original equipment standards of the tyres that were on their cars as original equipment , this type of car was developed in the design stage to work with the tyres that are fitted when the car was new, and the tyres should be fitted to the same standard as the old tyres. To finish you are still better buying cheap tyres that are new and not any other tyre types, “safety should always come first”. In short, most people are sensible to choose the product for the price that suits them. Some motorists go for Part Worn Car Tyres, this is fine but they should remember that a law was brought out in 1995 that states that part works should be pressure tested and inspected before labeling as safe to use, if the ones you are buying do not have this test label please do not buy them you simply do not know where they have been, opt for budget new ones instead. Yokohama makes excellent performance tyres gained from their motorsport participation. car. Some people try to cut corners by fitting “cheap tyres .” Hence,to this type of car. But these are built with higher speed ratings. Thus, than those for your more usual kinds of cars. They usually have a softer compound. For this reason, which enables them to grip better. Especially, when cornering in wet weather at high speeds. This better grip allows the drivers of performance cars.Consequently, to have more confidence when driving on slippery, greasy roads. Perhaps, after there has been a thunder storm. The secret of selecting the correct ones in the first place is to try stick to the ones that you have on as original equipment. For example, if you have Pirelli p-zero fitted then stick to the same. You can find as much information as you like on the internet, by checking out the manufacturers information about the ones you have fitted to your car. This is important for if the tyre that you have on has been superseded by a new type. It will tell you if the new form is comparable to your old one and so safe to fit when mixed on the same car. When you buy your new replacements, please make sure that the new ones have the correct speed rating. This is on the side-wall and is marked after the size and load rating for example 19565h15 88 H; the 88 is the load rating this tells you the weight that it can safely carry, and the”H” is the speed rating in this case above 130 mph. All the manufacturers are constantly upgrading their products to keep up with the ever-changing car makers quest for faster more economical cars, and the tyre companies must follow with better products. Top companies such as Michelin, Goodyear and Yokohama take part in racing events to test different compounds and designs for the average guy on the road. To sum up, in my opinion, I think that drivers of the faster cars should stick to the same ones that were in the car when they bought it. If the vehicle is third hand, then it should be all-right to fit mid-range tyres such as Yokohama tyres to save on costs but retain a good quality tyre. Yokohama Performance Tyres are rapidly catching up with the big boys, due to their involvement in F4 racing and other race events. https://www.pellonautocentre.com/wp-content/uploads/2015/06/Logo_PellonCleanTrans.png 0 0 Eric https://www.pellonautocentre.com/wp-content/uploads/2015/06/Logo_PellonCleanTrans.png Eric2018-11-02 04:19:442019-01-06 05:08:53Performance Tyres-Should You Fit Performance Tyres to a Performance Car?